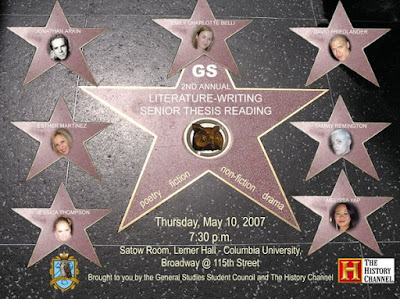 In spite of the success of the 2006 reading, GS students were still not permitted to participate in the honors courses and therefore were still barred from the year-end readings. An alum at that point, I helped plan another reading. When my contact at A&E/The History Channel received a PDF of the poster by email, she replied, "This is such a great event! I'd like to double our donation." I was so touched by how happy people were to help us celebrate the fine writing graduates of the School of General Studies. That year, we booked a much larger room in the Lerner student center and had adequate seating for our large audience! Due to several changes within the department -- allowing Columbia College (traditional-aged undergraduates) students to major in writing, modelling the program on the graduate MFA Writing program and integrating the undergraduate and graduate faculty -- ALL Columbia students majoring in Writing may now participate in department-sponsored readings!